Three little kids, and with a sum total of 96 cents in the bank… OK. Time to take a big chance… we would start our own business and the profit made from his sign painting would come to him, not some other guy he was working for. And, we would have complete say over what we did. We bought materials as needed, and paid cash for everything. Paying cash for everything was our way of life… we never bought what we couldn’t pay for. That way, we never got in ‘over our heads’. I was the bookkeeper, and the ‘goffer’ and any other ‘hand’ that was needed! I refused to learn how to clean a silk screen… messy job! I could cut a screen if needed, but not as good as my husband. One time I told my husband that I was going to phone the head office of Super Value. He said, “They don’t want to talk to you.” Yes they did!! I asked if they would like anything painted on their windows for a special time? My husband had to do a sketch of what we would paint… I remember it was their eleventh anniversary and we had eleven stores to paint as a trial. They wanted to know how much time it would take. I was the one that took the sketches to head office, so I got to know them (and they, me). From there on we did windows for them in the spring and at Christmas as well as special times. Other stores liked the idea, and had us do their windows as well. Not just food stores! Banks, hardware stores, clothing stores, barber shops, etc. One Christmas we did 105 stores! We had fun doing them, even though we were working. We stopped doing them when we started selling our paintings… his and hers! 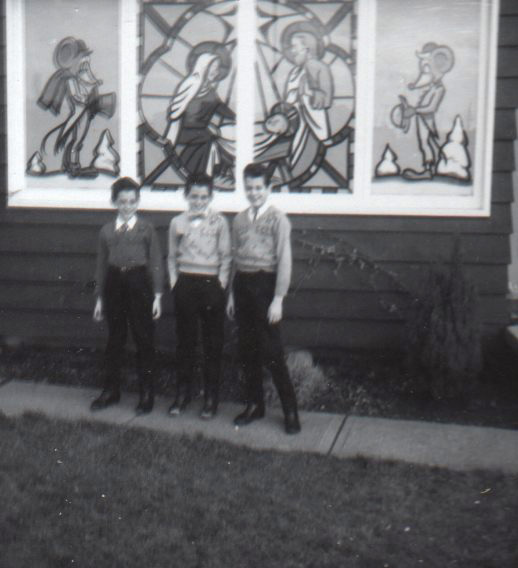 The photo is of our front room windows, with our three sons standing in front of them. What lovely windows. Almost as great as the boys in front. You have led a marvelous life. Perhaps not all roses and champagne, but so very rich in experience and love. It has been such a privilege to eavesdrop and window peek on your memories. Thank you for sharing. Exciting times – it was worth it to take a chance! Sometimes we need to do that more often. An inspiring story, Norma!